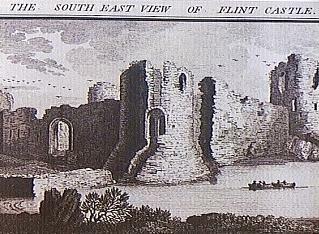 Right: The Buck brother's illustration of Flint Castle from 1742. It's rather strange that a web-site specialising in medieval castles should contain an item on a man and his brother who lived in the 18th Century. However, castle specialists often have recourse to refer to the work of Samuel and Nathaniel Buck when they are studying the structure of such strongholds, particularly when those structures are extremely dilapidated or even in ruins. With Samuel the prime mover in the contribution of the two to the recording of medieval architecture, Buck engravings provide a clearer representation of structure and fabric than that which is available to contemporary historians. For reasons that will be presently discussed, these drawings afford a kind of "half-way" picture of the deterioration of the buildings between their prime and today's sorry remains. There are two basic reasons for castles being reduced to that state of dilapidation as seen today, and often these reasons make a joint contribution. Firstly, the change in political, constitutional and social climate over the centuries has meant the abandonment of castles by their occupiers. Exceptions to this trend, of course, can be seen in the royal residences of the United Kingdom and in some of the aristocratic seats of Britain. That abandonment was inevitably followed by neglect, resulting in the buildings no longer being habitable. A "knock-on" effect, then, was the use made, legitimately or otherwise, of the fabric of the decaying structure, by other building agencies. This had a cumulative effect and thus, all that was left was a ruin, or even worse, just a pile of stones. The second reason for castle dilapidation represents an accelerated form of deterioration - destruction, wholly or partial, by some agency anxious to reduce the efficacy of the structures. The prime mover in this policy was Oliver Cromwell, supported by many of his commanders, who ordered a wholesale programme of rendering many castles of England and Wales ineffective by mining and other means. 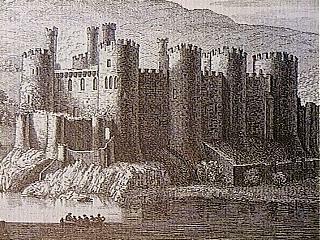 Right: The Buck brother's illustration of Conwy Castle from 1742. The rationale of this policy was a simple one. The Parliamentarians, the ultimate victors in The Civil War (1642 - 1649), reasoned that strongholds previously held by the Royalists were likely to be re-occupied by them again should they manage further uprisings. Consequently, rendering the fortifications ineffective would prevent this. In practical terms this meant that damage incurred in the fall of a castle would be left un-repaired and a calculated programme of destruction would augment this deterioration. Such a process was quaintly called "slighting" and precise details were officially issued for each structure to be thus treated. Despite the programme of slighting, a number of those former strongholds and family seats, some of which were to become Buck subjects, appear to have remained intact or even to have projected a greater level of grandeur than they did formerly. This can be explained by the fact that occasionally contemporary owners paid an indemnity to Parliament for good conduct in not using the structures against the establishment. In other instances the changed political climate of the Restoration allowed some slighted castles to be restored by their owners. However, the scene as presented to Samuel and Nathaniel Buck as they toured England and Wales in their quest to record the castles and abbeys of the country was generally one of dereliction. The abbeys, of course, had suffered their own fate in that direction at the hands of Henry VIII. 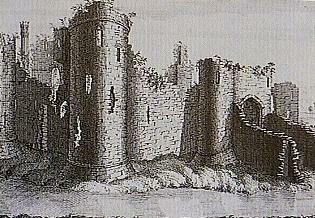 Right: The Buck brother's illustration of Grosmont Castle from 1732. The brothers did have the advantage, though, over today's observers in that the inevitable growth of vegetation in and around the ruins was nowhere as intense as is evident today. Hence the point made earlier that they saw the ruins at a half-way stage of dereliction. The Dictionary of National Biography quotes Samuel Buck as an "engraver and topographical draughtsman, (who) drew and engraved 428 views of the ruins of all the noted abbeys, castles, &c., together with four views of seats and eighty-three large general views of the chief cities and towns of England and Wales." Samuel Buck was born in Richmond, Yorkshire, in 1696, Nathaniel being a younger brother. Details of the brothers' training are not recorded but Samuel is known to have been professionally acquainted with the Yorkshire antiquaries Ralph Thorsebury and John Warburton. He was only 15 when his first work was published so it can be assumed that he acquired his drawing and engraving skills very early and very quickly. The northern connection manifested itself in these first works with views produced of edifices in Yorkshire, Lincolnshire and Nottinghamshire. At this stage in his career one presumes that the engraved views were produced and sold as single items or in small collections. In 1724 Samuel moved to London and this coincided with the publication of a fuller collection of his views, from drawings made between 1711 and that date. 1726 saw a second collection showing ruins of Lincolnshire and Nottinghamshire, while those of Cheshire, Derbyshire and Lancashire were to follow in 1727, this time produced in collaboration with brother Nathaniel who had now joined him in the capital. Based at "The Golden Buck in Warwick Street near Golden Square, St. James's", the pair then produced annual collections between 1728 and 1738, inclusively. Their work pattern was one of their issuing forth in late spring from Warwick Street to the shires and provinces where their subjects were sited. The summers would be spent drawing, while winters were spent producing the plates and engravings. Such a disciplined programme of operation was accompanied by an erstwhile attention to meeting annual deadlines. With the brothers now operating from No.1., Garden Court, Middle Temple, this reliability continued from 1739 to 1742 but these later collections included, more and more, panoramic views of cities. From 1743 onwards production in the genre became more piecemeal and it finally ceased with Nathaniel's death in 1754. 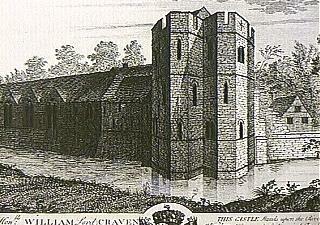 Right: The Buck brother's illustration of Stokesay Castle from 1731. In 1774 a comprehensive collection of the Bucks' work was published in 3 volumes, entitled "Buck's Antiquities or Venerable Remains of Above 400 Castles, &c., in England and Wales, with near 100 Views of Cities". Together with portraits of the artists/engravers, the publisher, R.Sayer of London, included historical accounts for each illustration. Thus, the volumes presented a graphical record of most of the important strongholds and ecclesiastical foundations of England and Wales. It would appear that in artistic terms the work of Samuel and Nathaniel Buck was not free from criticism. Verdicts included "hasty and slight drawings", "finished by the graver in a stiff manner", and "while representing the best in topographical engraving of their time, they are poor compared with other areas of engraving". "The value and real use of Buck's labours can be perhaps better appreciated by the antiquary and the ecclesiologist than the print-collector. As a painstaking delineator of architectural remains long since destroyed, Buck has never been surpassed for truthfulness of detail, often conveyed at the sacrifice of general effect." After Nathaniel's death, Samuel concentrated on teaching drawing and on exhibiting flower drawings. He survived his brother by many years, dependent in his last days on subscriptions from his friends and collaborators, dying at the age of 83 in 1779. He would be gratified to know that quite an active market exists in prints of his engravings, valued by both collector and historian alike. The Castles of Wales is honored to have been associated with the late Richard Williams. Mr. Williams was a free-lance lecturer and writer, specialising in the Medieval Welsh History of 1150 to 1450, including teaching courses for the Workers' Educational Association (Owian Glyndwr) and the Department of Continuing Education, University of Wales, Aberystwyth (The Two Llywelyns). His portfolio of lectures included such titles as Sir Edmund Mortimer - Traitor or Pragmatist, Owain Glyndwr, The Glyndwr Way, Owain Glyndwr - the Midlands Connection, The Two Llywelyns, and The Medieval Wedding.